Opening: "When Captain Cur's parrot died, he thud-thumped and tapped on his wooden leg all night long until his crew thought they'd go mad. Then at dawn, he tap, tap, crunched! "Mr. Bellows!" he roared. "I've stepped on me monocle!" Quartermaster Bellows rushed to his captain's side. "I have no bird," snarled the Cur. "I have no monocle. Me near vision's a blur, and me mood is bad and getting worse. So what are you going to do about it?" Brief Synopsis: The First and Second Mate are dispatched to solve the problem, but they make a slight error... the parrot they bring back is actually a teddy bear. Unwilling to face the Captain's wrath, the crew tell him it's a parrot (and without his monocle he can't see well enough to tell the difference!) and they teach the bear to be a pirate's parrot. Not until they board the Sea Weasel, ship of the dreaded pirate Captain McDagger, do they find out what a good job they did! Links To Resources: Pirate Coloring Pages, Pirate Games For Kids, How To Talk Like A Pirate, Pirate Ship Coloring Page, More Ship Coloring Pages and Facts About Pirate Ships. Please join us Monday when Clara Bowman-Jahn shares the story of the idea behind her debut picture book - Annie's Special Day! And PPBF bloggers, please leave your post-specific link in the list below so we can all come see what fabulous books you've selected this week! This sounds like such a fun book! And the fair sounds like it was very cool! This book looks great. I think my 7 year old boy would love it. Brick Church Fair! Memories from my childhood flood back. I miss NYC. I grew on Park and loved the lighting of the trees and Christmas caroling. Ha! This book sounds so funny! I just put it on hold at my library! Thanks, Matey! Me heart's a poundin' with anticipation! Pirates, a parrot & a teddy bear! What a fun book; think I'll follow Penny's lead & hold it at the library. Can't imagine that anyone outshone you at the fair, Susannah! And speaking of NYC at the holidays, was strolling by Lord & Taylor on Fifth yesterday (between buying books & picking up books at the library) & viewed their holiday windows: Santa surrounded by books in one window & books appearing in several other windows, too. Worth a walk-by. Wow, Susanna!! I am so impressed. A NYC church fair! :) Just you being in NYC is amazing. Thanks for putting me on the nice list. I was worried there for a minute. Can't wait to read your pick Susanna - love pirate jargon and silly pirates doin' good! 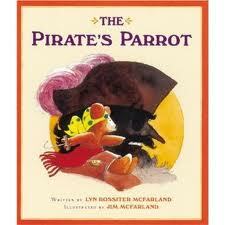 I love pirate books too, and the thought of a teddy bear on a pirate's shoulder is hilarious! I'm glad you had a safe trip. Glad the fair was fun. The book looks great and the list too. It's like a Thanksgiving feast and I can't sit down to eat just yet. I have one more thing (well several for a class project), then I can read through the books. Now that's a unique turn of events...just the kind of twist we need for PiBoIdMo and 12x12 ideas. Sounds like a fun pick, Susanna! This sounds VERY entertaining. Clever! That book sounds great! My kids are having so much fun with all the turkey stories and songs at school. It's such a great time of year! Leigh, you should check out Hannah Holt's blog http://www.lightbulbbooks.com/blog/2012/11/turkey-craft/ where she posted some really fun turkey crafts for kids!!! I love all the pirate talk and the fun twists! What a fun and quirky book. Like that the mates trick the captain and so will the kids. Are we going to post PPB next Friday. Just thought I'd ask. Will do what ever you decide. You know, I thought about cancelling PPBF next week, then thought it might be confusing because some people have scheduled their posts ahead. I should have put a note in this post, but I think I'll leave it up to everyone to do what they like. I may not post a book, but I will post the list for anyone who's post is scheduled. Thanks for asking. Not as amazing as it sounds, Clar - I grew up there :) and I do still know a few people in that neck of the woods... like my brothers :) Glad you like the look of the book - it's a fun one! Oh, I used to LOVE walking by to look at all the decorated store windows - they were so amazing! I don't remember which stores, besides Lord & Taylor and FAO Schwartz, but I know there were quite a few, and we'd walk along and see them all! Just magical! Oh! This looks great! A scary pirate with a "swaggering" bear! What a great combination. I'll have to check this one out! I didn't get a PPBF post done in time today, but oh this Pirate's Parrot sounds like an ABSOLUTE must-read!! And congratulations on the book fair. Sounds like quite a time! Read a great book about scurvy once, by Stephen Bown! This sounds like a great one, Susanna. I'll definitely look for it. I am a sucker for a pirate book -- arrrrrrgh. I know I would like this book. A teddy bear as a pirate's parrot? Ingenious!